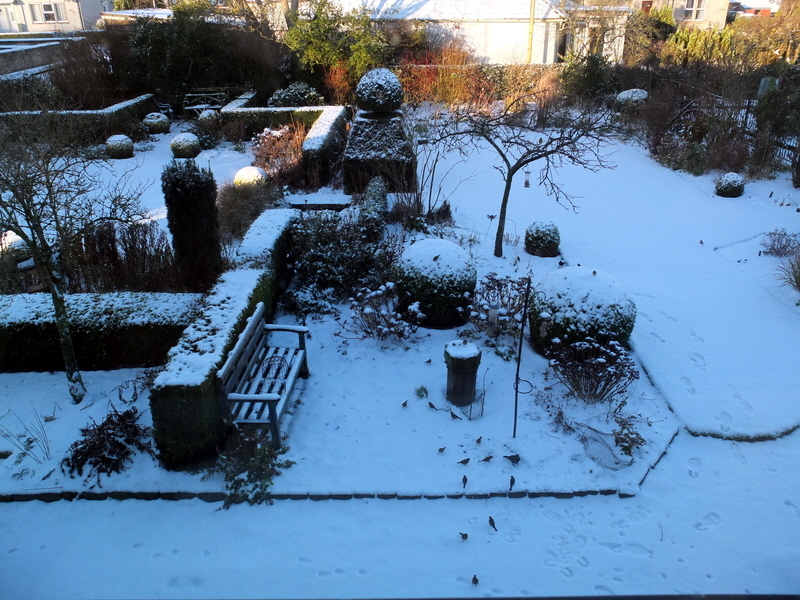 Today’s picture shows the garden early in the morning. That much snow had fallen during the night. 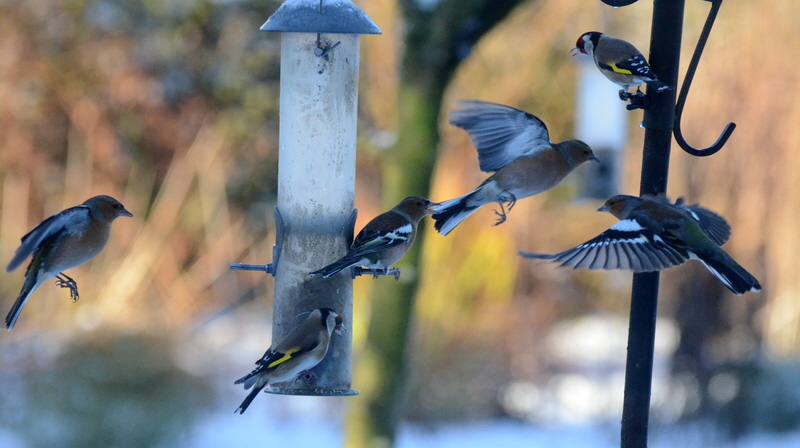 It meant a busy time at the feeders…. …both in the air and on the ground below…. 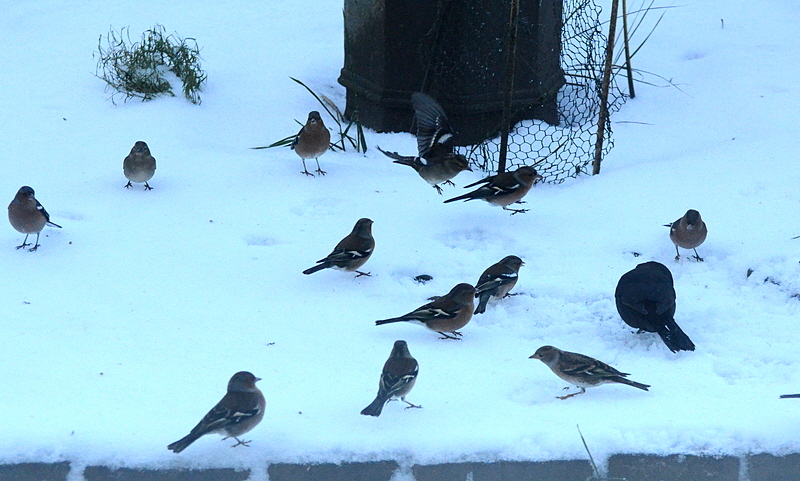 A chaffinch flies in to join the ground crew. 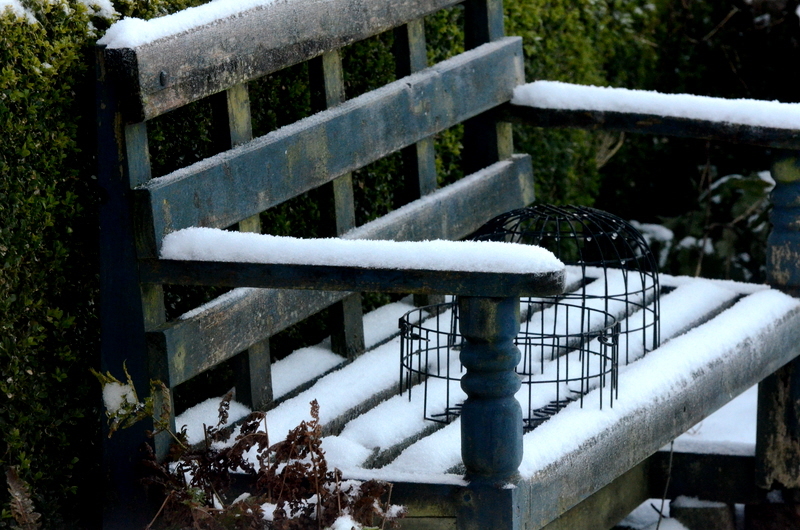 As usual the feeders were in deep shadow but it wasn’t too long before the plum tree offered basking opportunities. 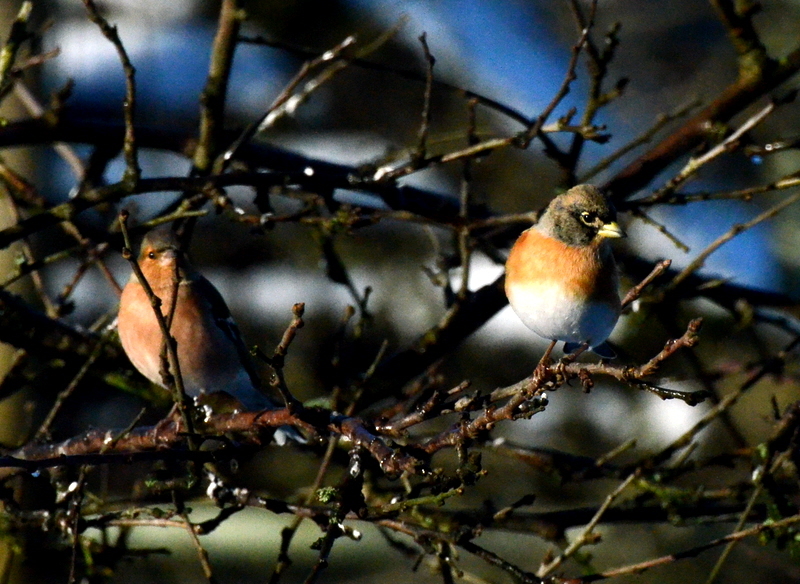 Brambling and chaffinch taking in some rays. It was the first Saturday of the month so I went to the producers’ market at the Buccleuch Centre and made my usual purchases of fresh fish, venison and local cheese. I called in my local corner shop on my way home to make sure my spending power was spread about. The shopkeeper complains about the producers’ market and I can feel his pain but he doesn’t sell fresh lemon sole or venison so I feel bad but not too bad about going past his door to get to the market on one day a month. 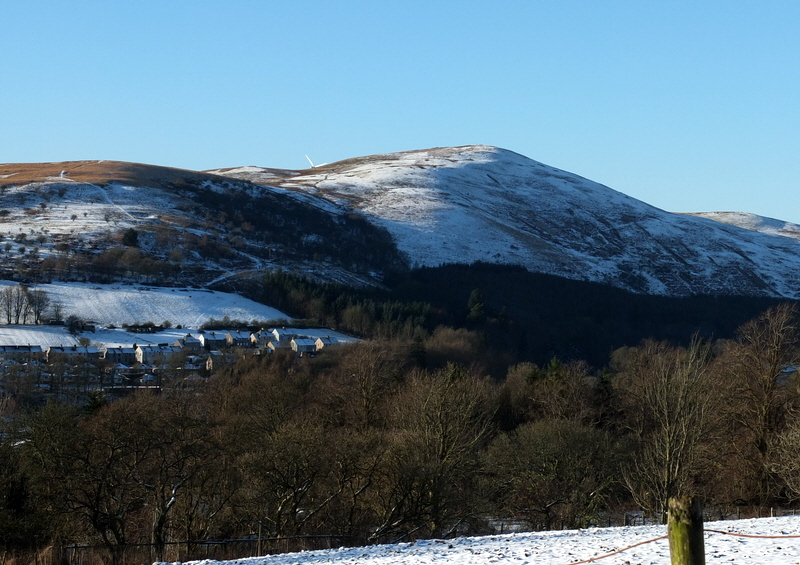 After lunch, Mrs Tootlepedal was waiting for a B&B couple to arrive so I packed the big camera up and put sandycam in my pocket as well and set off to walk up the third of the four Langholm hills. This time, Whita was my target. 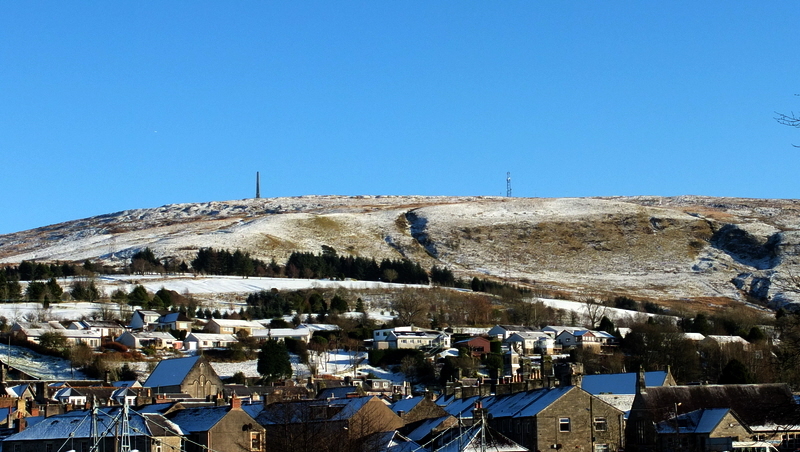 There hadn’t been enough snow to properly cover the hills round the town. I took the direct route to the summit and was able to look back as I puffed my way up the track past the golf course to see the hills I walked on yesterday. The going underfoot was snowy but not slippery and walking was quite comfortable and there was no need for my anti slip Yaktrax which was just as well as I hadn’t put them on. I used the panoramic ability of the sandycam to capture just a taste of the views that I was enjoying. 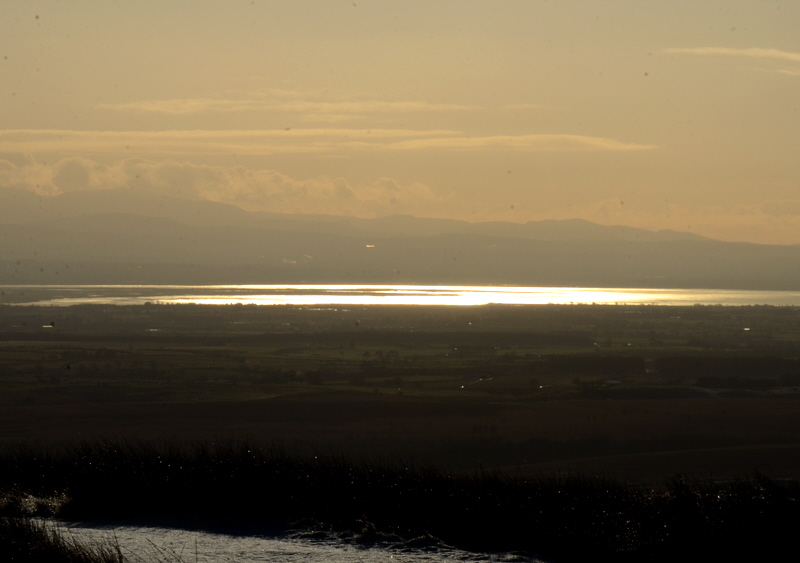 There was no mist over the Solway today and the low sun glistened on the waters of the firth. As always at this time of the year on a sunny day, the contrast of light looking south and north is striking. 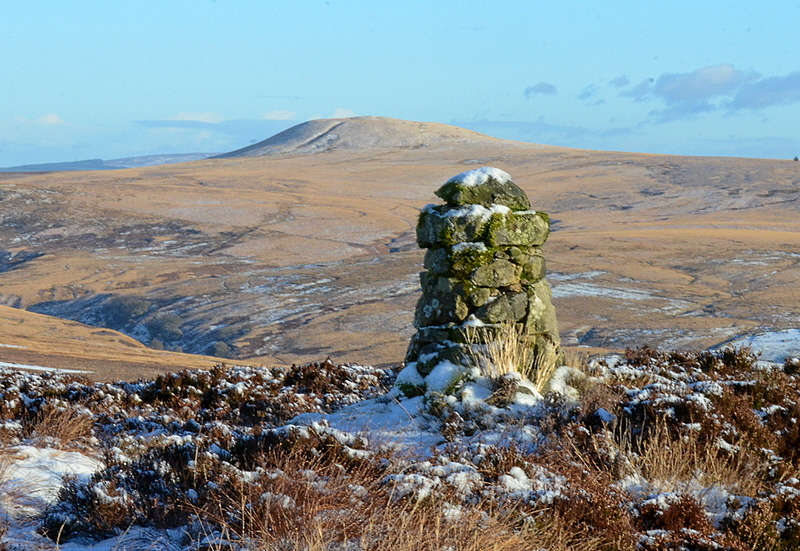 When I reached the summit of Whita, I was able to look across the valley to see the tiny black dot which was the trig point that I had stood beside yesterday. 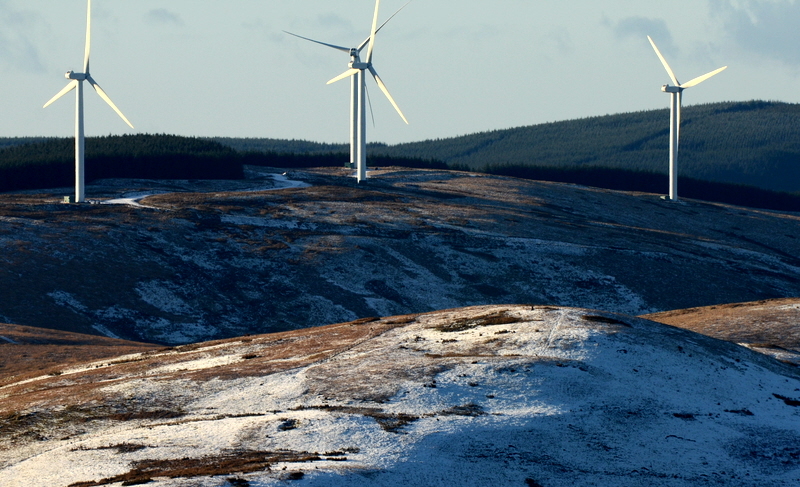 It was dwarfed by the windmills on the hill behind. It was chillier today in a light wind and the windmills were actually making a little electricity. 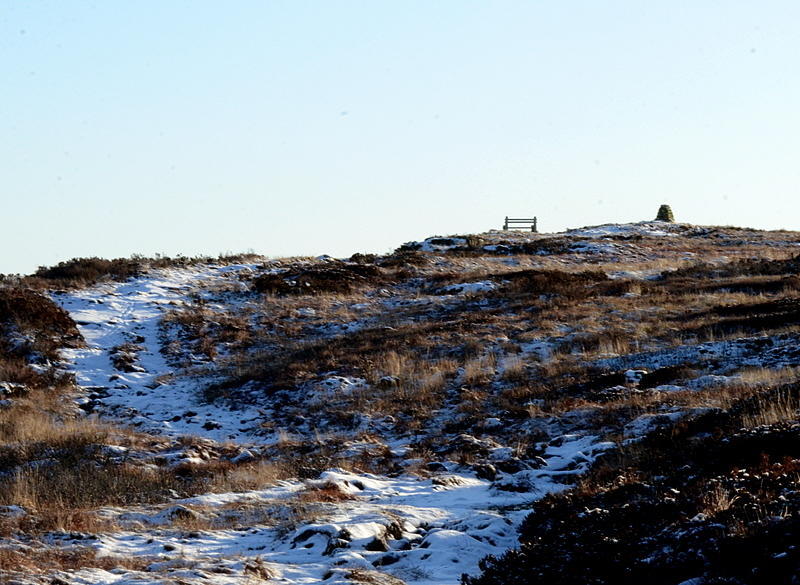 …one a bit further on which I haven’t included here and one at the Castle Craigs complete with a handy bench. 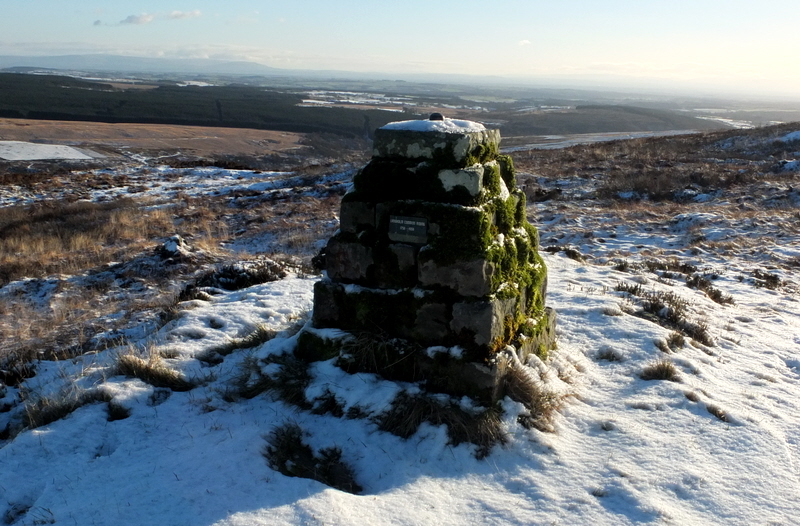 The cairn there commemorates 200 years of the Langholm Common Riding and marks one of the furthest extents of what was once the common land. There is a fine view behind it. I don’t sit on the bench but walked back to the track down to the road and then on down the road. After a while, I turned back onto the hill and walked along to the top of the golf course. It was looking brilliant with untouched snow covering fairways and greens and the cropped grass made for an easy walk back to the town. 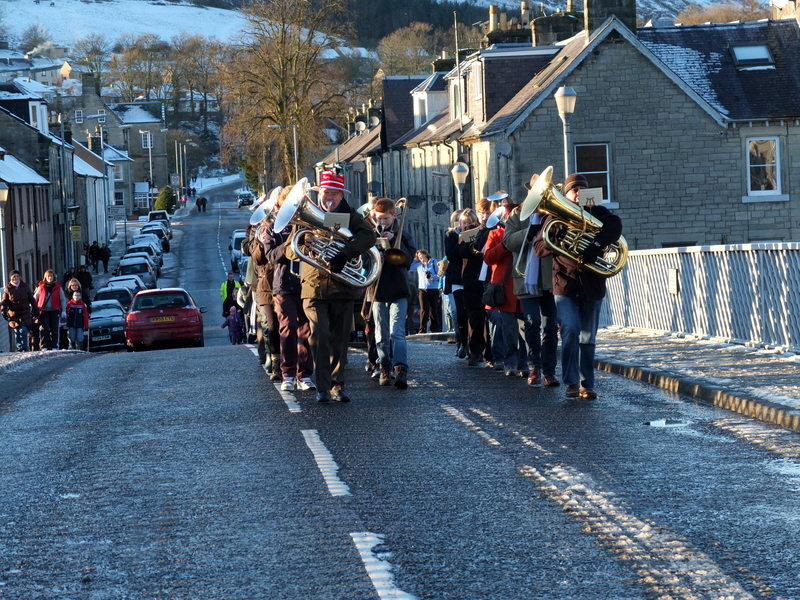 I was crossing the High Street when I heard what sounded like the Town Band playing seasonal music in the distance so I walked along to the Town Bridge to see what was going on. It was the Town Band, or at least a part of it. I wasn’t expecting to see the person following the band along. 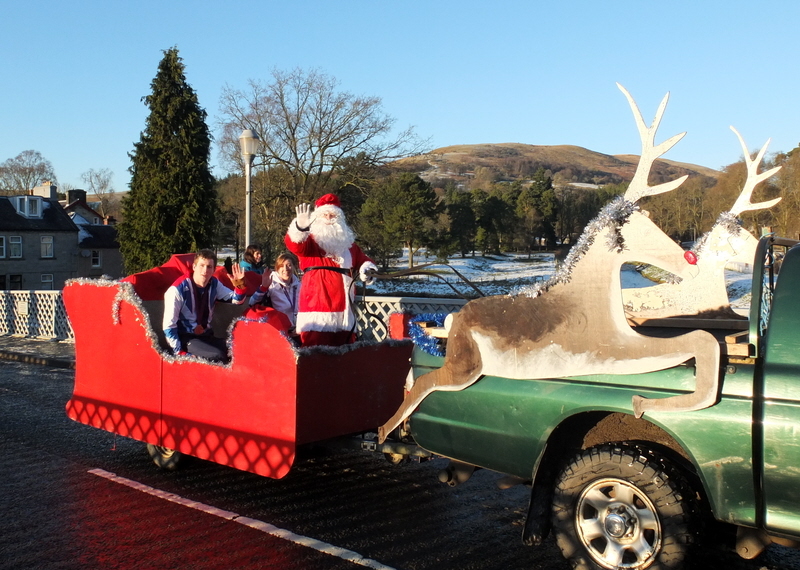 He had two local medal winning paralympians, Libby and James Clegg in the back of his sleigh. They were going to help turn on the Christmas lights later in the evening. By the time that I got home, my legs were complaining vociferously about the steepness of the walk up the hill and the folly of the diversion to the Castle Craigs. I soothed them with tea and toast. 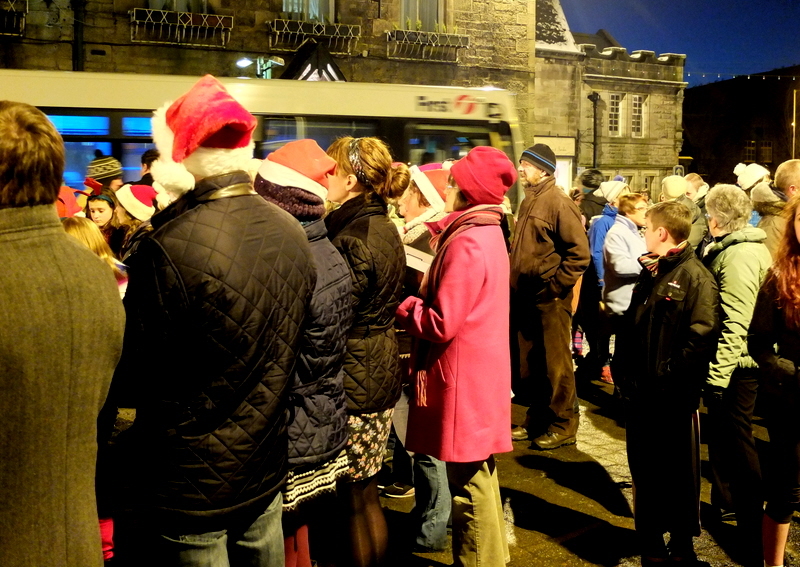 Not long after I got home, Mrs Tootlepedal went off to sing with a small group from the local operatic society to add to the general jollity at the switching on of the lights. I went up a little later to watch her at work. She was wearing her carol singing pink coat. There was a good crowd out and they gave a resounding cheer when the lights came on. 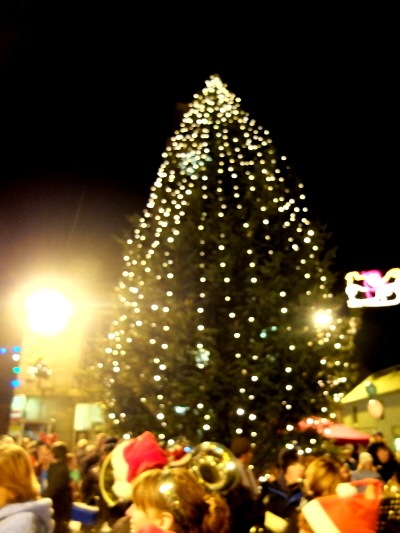 I recorded the illuminated tree for posterity. Because of the way the lights are draped over it, slightly squashing the branches in, it does look a little more like a cactus or an aubergine than a Christmas tree but we like it all the same. 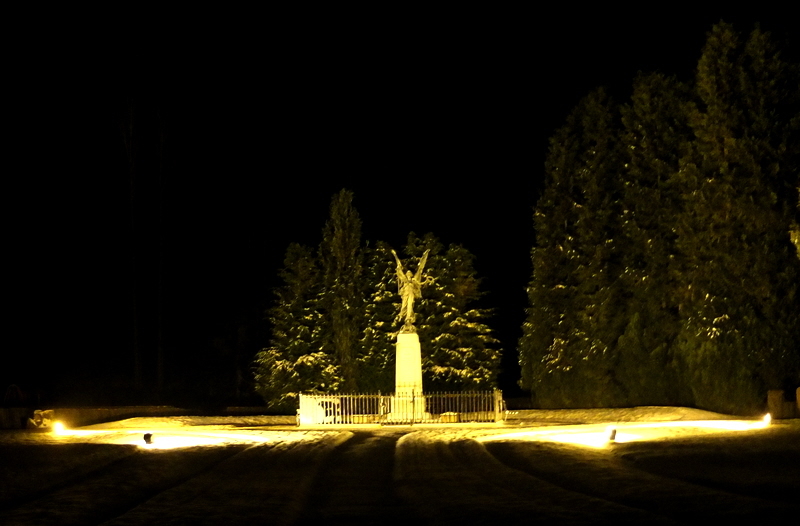 On my way home, I stopped to snap the war memorial in the park. It looked very striking in the snow. Another good day was rounded off by that rare thing, an excellent TV drama. This was back to back programmes five and six of the Killing, my favourite gloomy Danish police investigation. There was a rather different flying bird of the day today. I caught this beautiful brambling entirely by accident. 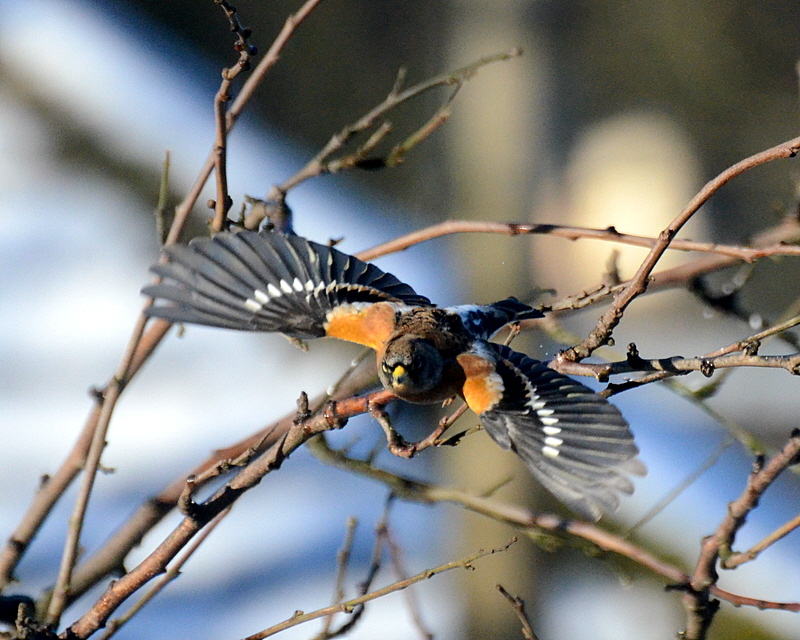 I was trying to get a ‘perching in the plum tree’ shot when it flew off.